Futurition is a set of June festivals and events in Santa Fe that include artists and institutions working on the boundaries of arts, science, and technology. In this program we speak to people from the Santa Fe Institute and Currents New Media are producing events that bring people together across disciplines, and that invite audiences of all ages and interests. 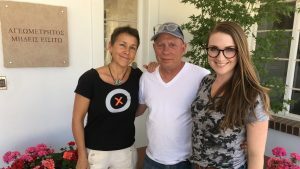 We speak to Caitlin McShea of the Santa Fe Institute, Frank Ragano of Currents New Media, and artist Agnes Chavez.